SwanCon36 was a wonderful convention and merriment was had by all. I was on a lot of panels and even managed to sit in the audience for quite a few that I wasn’t involved with — which doesn’t always happen, depending on how busy I am catching up with people and how good the bar is (and it was a very good bar). My program highlights were seeing Kaaron Warren interview Ellen Datlow — it was more of a friendly conversation — as well as being on a very lively discussion panel with Kaaron, Ellen and Paul Haines called “Darkness Beyond Borders”. Heaps of fantastic audience involvement and fascinating debate about horror and dark fiction, where the genre fits and how it bleeds into the mainstream. The live Galactic Suburbia podcast was also a lot of fun to watch and there were quite a few enthusiastic discussions over the weekend — on and off the program — concerning eBooks and social media. Much food for thought! Speaking of podcasts, Jonathan Strahan from Coode Street, Helen Merrick from Pangalactic Interwebs, Alex Pierce from Galactic Suburbia and my own good self got together to record a live SwanCon MegaPodcast on the Friday afternoon. You can download or stream it from The Writer and the Critic, and the others will no doubt have their own links floating about the place in due course. It was a blast and gave me a welcome practice run for recording W&C with Ian live at Continuum 7 in June. On Sunday afternoon Ticonderoga Publications threw a 15th Birthday celebration and launched their two newest anthologies, More Scary Kisses and Dead Red Heart. There were yummy cupcakes and fine wine and some heart-fluttery readings — I read an extract from “Frostbitten”, the story I have in More Scary Kisses, although I had to make a last minute switch when I saw there were kids in the room! Ticonderoga has been releasing some remarkable books in the last few years, with more exciting titles to come. I’m particularly looking forward to Bluegrass Symphony by Lisa L. Hannett, due for release later this year. Locus has published the full list of Ditmar nominees and winners, as well as the results of the Tin Ducks and the other awards presented at SwanCon over here. Congratulations to everyone! Now I’m back home and very tired, but also very much looking forward to the next time I get to hang out with the fine folks that make up the Australian speculative fiction community. Enthusiasm! Creativity! Gin and tonic! What more can you ask from a long weekend? ‹ PreviousWin Books with Aussie Author Month! It was really nice to see you & talk in person this weekend. I look forward to when you invade Tasmania with your box of podcasting technology and we can combine two of our favourite things – talking in person and podcasting! Probably best he doesn’t know anything until he wakes up in the suitcase. Yes, so lovely catching up with you at the con- if not enough chatting time- and being on panels with you. 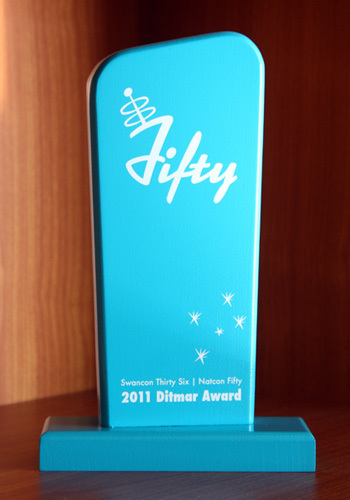 And congratulations on the Ditmar! richly deserved. I was so happy to meet you in person 🙂 I wish I’d been at the con longer so I could have spoken to you again. Me too! I wish I’d had more time to swan (heh, pun intended) about as well. So many people to whom I just said a fleeting few words, fully intending to come back for a proper chat, and then the con was over. Blurgh. Next time, more time!